The Macquarie University NMR Facility is located within the Department of Molecular Sciences (Building F7B). After completing an exciting refurbishment project at the end of 2016, the NMR Facility is now home to two brand new instruments as well as Australia's first parahydrogen generator. 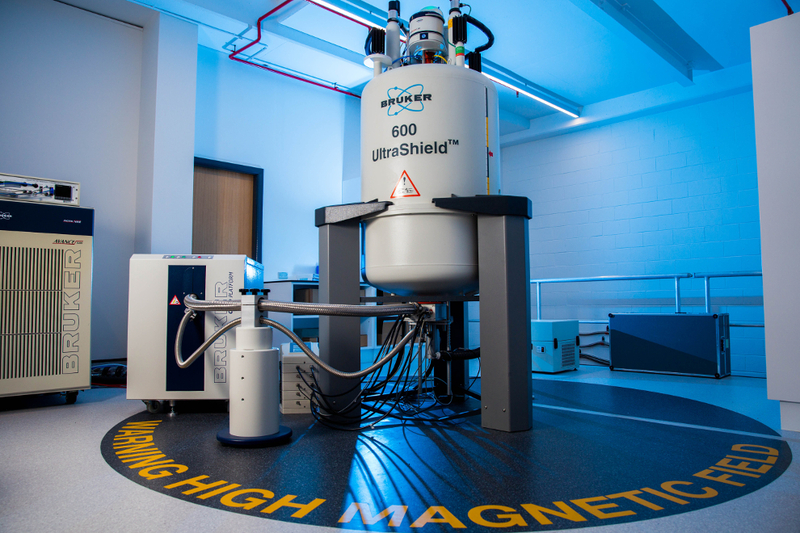 These new instruments join the 600 MHz Cryoplatform in supporting the solution-state NMR requirements of our researchers (see Instruments), including in-situ photolysis experiments where light is transmitted to the sample volume by means of a fibre optic cable. Both of the new spectrometers have BCUII chiller units attached to facilitate low temperature experiments, and these units have demonstrated unparalleled performance thanks to the exacting specifications of our new nitrogen generation system (see Nitrogen Generator). This significant investment in Macquarie University's infrastructure is allowing users to routinely access temperatures down to 200K (-70C) without the use of liquid nitrogen, enabling such experiments to be carried out far more quickly and safely than at any other institution in Australia. A full sample service is available to external clients on a fee paying basis, see Commercial Analysis for further information. Please conctact Dr Nicole Cordina nicole.cordina@mq.edu.au for any enquiries about this facility.